In light of the official MLB twitter account inexplicably leaving Yadier Molina off of their first tweet (which was deleted within minutes due to an huge influx of argumentative tweets) on the first-half National League MVP, I decided it was a perfect time to write a post exploring the thought. If the season ended today, who would be the National League MVP? Since that thought first struck my brain, the MLB has since posted another tweet which includes Molina, but this, too, sparked a debate for Cardinal Nation–well, MLB, what about Matt Carpenter? The All-Star second base man and extraordinary lead-off man. Fangraphs has a “Clutch” statistic defined as “how much better or worse a player does in high leverage situations than he would have done in a context neutral environment.” Well, Molina takes the edge in Carpenter on this one–0.95 to 0.03. To put these numbers into context, anything 1 or higher is considered “great,” so Yadi is nearly great in the Clutch category; whereas, Carpenter, at 0.03, is just barely average in the same category. To make offense sabemetrics fans happy, I will include one more stat: wRC+. This stands for weighted Runs Created Plus. This statistic basically shows, via percentages, how many runs a player “creates” for his team compared to the league average. The league average is considered 100. Molina’s wRC+ is 145 and Carpenter’s is 151. Thus, that means that Molina and Carpenter have created 45% and 51% more runs than the league average, respectively. Thus, both are considered excellent and despite Carpenter being higher, it really is not by that much. Enough about offense, let’s discuss what Molina really excels at–defense. “Defensive Runs Saved” is a statistic that basically compares a fielder’s plays made to that of the league average fielder. Anything from 5-10 is above average, from 10-15 is great, and 15 or higher is considered Gold Glove Capable. So far this season, Molina is at 6 (meaning he is on pace for the “Great” range and could reach the “Gold Glove” range) while Carpenter (at second base) is just at 2–average. Defensive Wins Above Replacement (dWAR), which I found on ESPN.com, not Fangraphs, is a good statistic to compare as well because it shows just how important a player is in the field compared to another player (either on the bench or in the minors) that could be used as his replacement. Molina’s dWAR is 1.2–4th highest of all catchers. Carpenter’s dWAR is just 0.4–30th in the second base category. Well, let’s just be honest, Molina’s DWAR is that much higher than Carpenter’s because Yadi’s replacement/backup just is not really that good. I give a ton of respect for the role he has on this team, but he is barely a top-50 catcher in this league. Yadi has thrown out 13 of 29 base stealers–45%. His Catcher’s ERA is second in the league at 3.24. Conversely, Tony Cruz, who has started 11 games behind the dish, has the 78th best Catcher’s Earned Run Average in the MLB at 4.68. Of six stealing attempts, he has only thrown out one. I know it is a small sample size compared to Yadi’s 82 starts, but that is a huge difference. Wins Above Replacement (WAR). I will admit that I have used this statistic before without really describing it to my readers. Thus, according to Fangraphs, this is basically what it means, “If this player got injured and their team had to replace them with a minor leaguer or someone from their bench, how much value would the team be losing?” Thus, it basically is a pretty all-inclusive stat as to how valuable a player is to his given team. Molina’s WAR is 4.3 while Carpenter’s is 4.6. Given, this is basically a wash as a comparison, but I wanted to highlight that both are in the All-Star range (4-5). If they continue trending upward, both have a chance at eclipsing a WAR of 6 which is considered MVP range. Sure, you cannot put a number on intangibles. Thus, with no number available, how can you really put a value on a player’s intangibles? Well, some would argue you can’t, but I will make my attempt at it anyway. Sabermetricians everywhere will cringe at the next few paragraphs I write, but with the offensive category being pretty close, and the defense statistics swaying towards Yadi, I have decided that it was the time to explore this aspect as well. I undoubtedly agree that the Cardinals were in dire need of a quality lead-off hitter, and Carpenter has performed at an All-Star level to the point where if he keeps it up, he should most definitely be considered the MVP. I said this in an article back in May. However, with the way the pitching staff has been, I truly believe that Yadi is the team MVP. The team has had nine different starting pitchers, and it is only mid-July. So far this season, Yadi has now caught ten different rookie pitchers. There are nine pitchers that have started at least three games for the Cardinals. Despite this, the team has still maintained what many see as a top five pitching staff. What role has Yadi played in this? Though there may be no true statistic for this, but his constant behind the plate cannot be understated. Shelby Miller, just 21 years old, is probably the team’s second best starter. Just last season, fans were calling for his trade saying he was not mature enough to be a top-end starter. Thus, he either has really grown up in less than a year or his battery-mate has played a key role in his development this season. I tend to think that Yadi has played a huge role in his development as a pitcher. If given the opportunity to interview him, that would be the first question that I would ask him. What it really comes down to is what the voters choose to consider for MVP. I do not have a vote, so does my opinion matter? Nope, but that obviously did not stop me. To me, an MVP is exactly what it says–the Most Valuable Player. I know that Carpenter leads Molina in various offensive statistics (even more than I have listed above), but he really does not lead Molina by that much. How important is this, though? Because despite Carpenter leading Molina in these statistics, Molina is still among the league leaders in each of them as well. Thus, because of this, I give the slight advantage to Yadi based on his defense and the intangibles. You may not be able to put a number on intangibles, but to me, they are incredibly important. That is why I consider Yadier Molina the league MVP at this point. It is simply my opinion, and I would appreciate any comments you may have regarding my analysis. 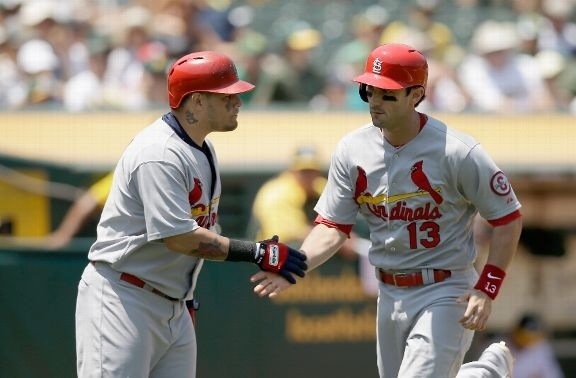 Carpenter is more than deserving of MVP consideration, but the 2013 should go to Molina. Remember that this article was written based on if the season ended today. Both will need to keep up their pace if they want to be considered for the award at the end of the season. Updated (7/20/13): Including other candidates to make it a better representation of MVP discussion. Based on how the second half goes, other candidates like Troy Tulowitzki and Andrew McCutchen could make the list, too. However, I made my argument based on the first half alone. This entry was posted in MVP, St. Louis Cardinals and tagged Matt Carpenter, Yadier Molina by stlcupofjoe. Bookmark the permalink.